The pterygopalatine fossa is a bilateral, cone-shaped depression extending deep from the infratemporal fossa all the way to the nasal cavity via the sphenopalatine foramen. It is located between the maxilla, sphenoid and palatine bones, and communicates with other regions of the skull and facial skeleton via several canals and foramina. Its small volume combined with the numerous structures that pass through makes this a complex region for anatomy students. 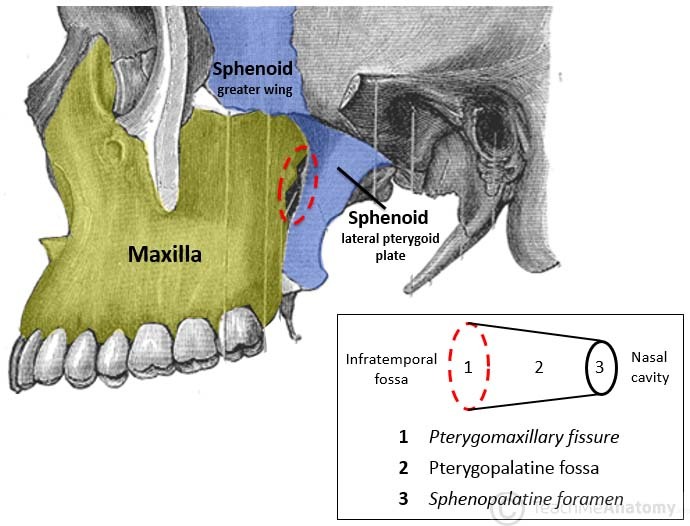 This article will discuss the pterygopalatine fossa, and consider the structures involved according to their respective foramina. Fig 1.0 – Left infratemoporal fossa demonstrating the opening of the pterygopalatine fossa (circled in red). Note: the zygomatic arch has been removed in this image. Anterior: Posterior wall of the maxillary sinus. Posterior: Pterygoid process of the sphenoid bone. Inferior: Palatine bone and palatine canals. Superior: Inferior orbital fissure of the eye. The Pterygopalatine Fossa contains many important neurovascular structures. Here we will discuss the maxillary nerve and its branches, the pterygopalatine ganglion and the maxillary artery and its branches. The maxillary nerve is the second branch of the trigeminal nerve (CNV2). It passes from the middle cranial fossa into the pterygopalatine fossa through the foramen rotundum. The main trunk of the maxillary nerve leaves the pterygopalatine fossa via the infraorbital fissure. Here, it enters the infraorbital canal of the maxilla and exits below the orbit in the infraorbital foramen to contribute to the sensory innervation of the face (figures 2.0 & 2.1). While in the pterygopalatine fossa, the maxillary nerve gives of numerous branches including the infraorbital, zygomatic, nasopalatine, superior alveolar, pharyngeal and the greater and lesser palatine nerves. The maxillary nerve also communicates with the pterygopalatine ganglion (discussed below) via two small trunks, the pterygopalatine nerves (figure 2.1). These nerves suspend the ganglion within the pterygopalatine fossa. 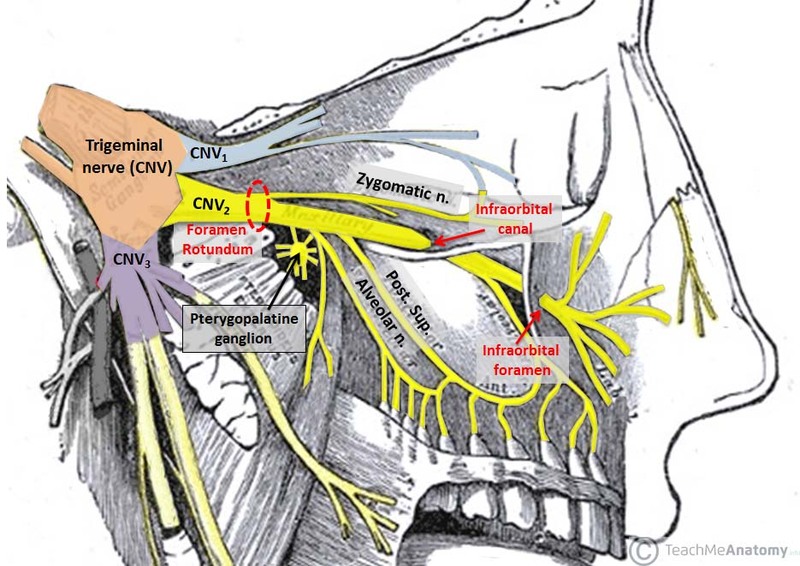 Fig 2.0 – The main trunk of the maxillary nerve (CNV2); showing the origin at the trigeminal nerve and its path to external facial structures. 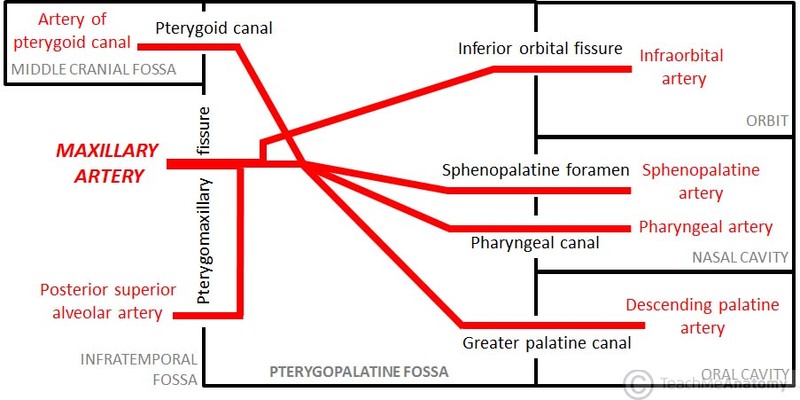 Fig 2.1 – The branches of the pterygopalatine ganglion and the maxillary nerve. Note: For simplicity, this schematic does not show: the contribution of the facial nerve (CNVII) to the pterygopalatine ganglion, the posterior superior alveolar nerves, or the nerve of the pterygoid canal. The pterygopalatine ganglion sits deep within the pterygopalatine fossa near the sphenopalatine foramen. It is the largest parasympathetic ganglion related to branches of the maxillary nerve (via pterygopalatine branches) and is predominantly innervated by the greater petrosal branch of the facial nerve (CNVII). Postsynaptic parasympathetic fibres leave the ganglion and distribute with branches of the maxillary nerve (CNV2). These fibres are secretomotor in function, and provide parasympathetic innervation to the lacrimal gland, and muscosal glands of the oral cavity, nose and pharynx. Fig 3.0 – The pterygopalatine ganglion and its branches. The maxillary artery is a terminal branch of the external carotid artery. The terminal portion of the maxillary artery lies within the pterygopalatine fossa. Here, it separates into several branches which travel through other openings within the fossa to reach the regions they supply. Sphenopalatine artery (to the nasal cavity). Descending palatine artery – branches into greater and lesser palatine arteries (hard and soft palates). Infraorbital artery (lacrimal gland, and some muscles of the eye). Posterior superior alveolar artery (to the teeth and gingiva). At their terminal ends, the sphenopalatine and greater palatine arteries anastomose at the nasal septum. Fig 4.0 – Branches of the maxillary artery and their related foramina and cavities. There are seven openings (also known as foramina) that connect the pterygopalatine fossa with the orbit, nasal and oral cavities, middle cranial fossa and infratemporal fossa. The openings transmit blood vessels and nerves between these regions. Posterior superior alveolar nerve – a branch of the maxillary nerve. It exits through the fissure into the infratemporal fossa, where it goes on to supply the maxillary molars. Terminal part of the maxillary artery – enters the pterygopalatine fossa via the fissure. The foramen rotundum connects the pterygopalatine fossa to the middle cranial fossa. It is one of three openings in the posterior boundary of the pterygopalatine fossa. It conducts a single structure, the maxillary nerve. Pterygoid canal – runs from the middle cranial fossa and through the medial pterygoid plate. It carries the nerve, artery and vein of the pterygoid canal. Pharyngeal canal – communicates with the nasopharynx. It carries the pharyngeal branches of the maxillary nerve and artery. The inferior orbital fissure forms the superior boundary of the pterygopalatine fossa and communicates with the orbit. It is a space between the sphenoid and maxilla bones. The zygomatic branch of the maxillary nerve and the infraorbital artery and vein pass through the inferior orbital fissure. The greater palatine canal lies in the inferior boundary of the pterygopalatine fossa, and communicates with the oral cavity. The canal is formed by a vertical groove in the palatine bone which is closed off by an articulation with the maxilla. Branching from the greater palatine canal are the accessory lesser palatine canals. The greater palatine canal transmits the descending palatine artery and vein, the greater palatine nerve and the lesser palatine nerve. This foramen is the only opening in the medial boundary. It connects the pterygopalatine fossa to the nasal cavity – specifically the superior meatus. It is formed by the sphenopalatine notch at the superior aspect of the perpendicular plate of the palatine bone and the body of the sphenoid. The sphenopalatine foramen transmits the sphenopalatine artery and vein, as well as the nasopalatine nerve (a large branch of the pterygopalatine ganglion – CNV2). Extensive dental surgery may require total nerve block of the maxillary branch of the trigeminal nerve (CNV2). The maxillary nerve in the pterygopalatine fossa is most often approached intraorally via the greater palatine canal. The sphenopalatine artery is often referred to as the artery of epistaxis (nosebleed). In cases of chronic epistaxis, the pterygopalatine fossa can be surgically approached via the maxillary sinus, and the artery ligated to control bleeding. Which of these makes up the anterior border of the pterygopalatine fossa? 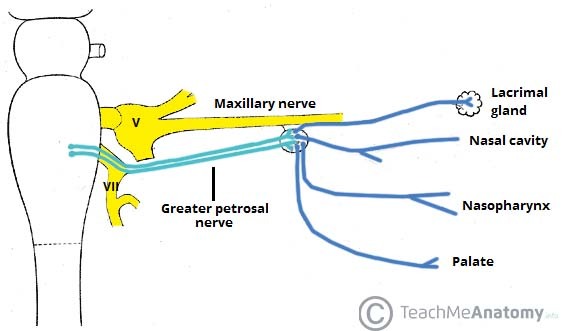 The posterior superior alveolar nerve, which travels through the pterygomaxillary fissure, is a branch of which nerve? Which of the following is not a branch of the maxillary artery?